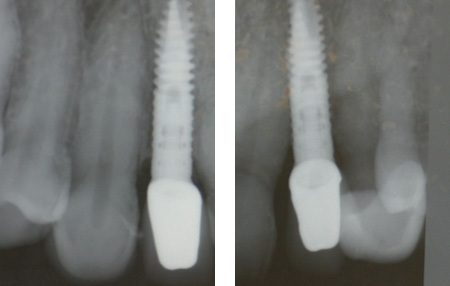 This patient had excessive anterior tooth wear resulting in very short front teeth. 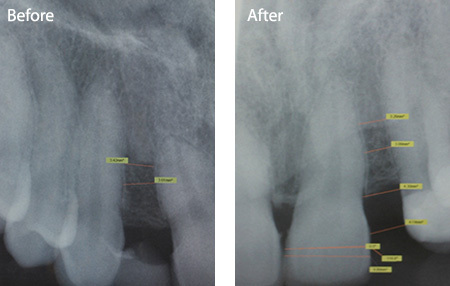 We opened the bite and provided ceramic crowns using the very latest digital scanning technology which requires not impressions. This patient came to see me because she hated the appearance of her teeth. They were discoloured, worn down, crowded in the lower arch and had many silver amalgam fillings. Upper anterior veneers to give a natural smile. 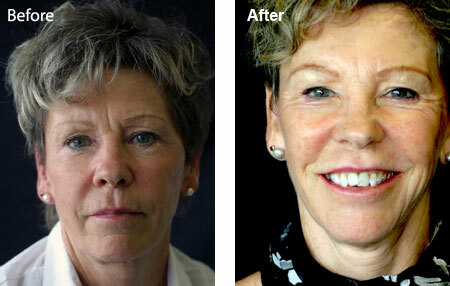 This smile makeover involved providing veneers, crowns and a bridge. This patient was referred to see me from another practice because she had retained deciduous canines and congenitally missing permanent canines. 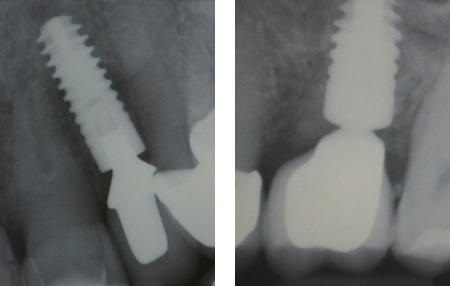 2 implant were placed to restore the spaces. This makeover involved reconstructing the occlusion using crowns and placing implants in the upper left lateral incisor and first molar positions. This lady had a bridge and a crown that repeatedly came loose, so decided to visit us to see what could be done. 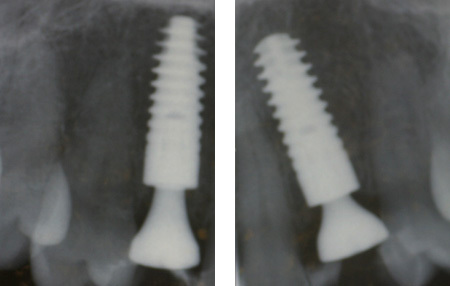 We fitted a dental implant and a new crown next to it - a great result. This is a gentleman who had many missing back teeth and as a result his front teeth had become very worn down. 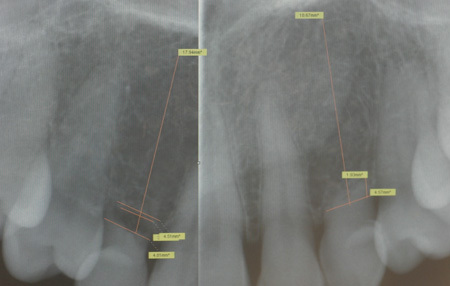 Treatment required a full mouth reconstruction, involving placing implants to replace the missing lower teeth, opening the bite and preparing ceramic crowns for all teeth. 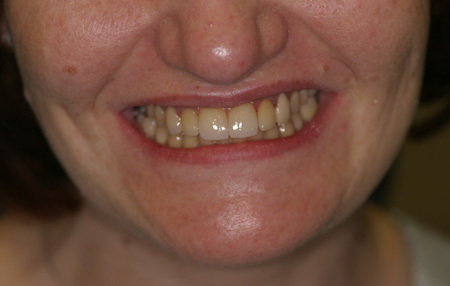 This patient had congenitally absent lateral incisors. 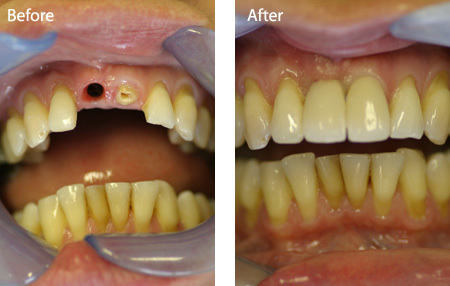 In spite of limited space, we were able to place implants to replace the missing teeth, as well as replacing the old veneers on the central incisors. 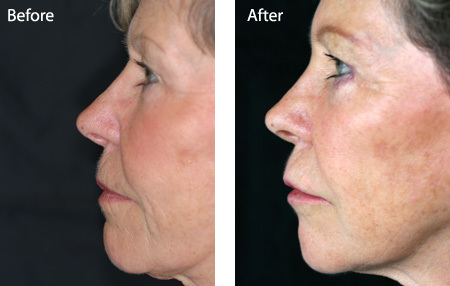 Silhouette Soft thread lifting – a procedure to give a non-surgical lift to address skin laxity and jowls using resorbable threads placed under the skin. 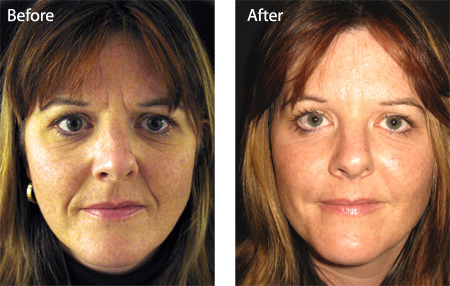 This patient wanted to look better and feel good about the way she looked. Her treatment involved Botox treatment to her forehead, cheek augmentation, lip enhancement and dermal fillers to the lower face. After treatment she truly did look 10 years younger. 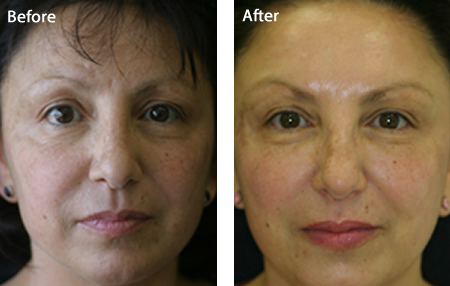 This lady was keen to reduce the appearance of her frown lines and the folds between her nose and mouth (known as nasolabial folds). 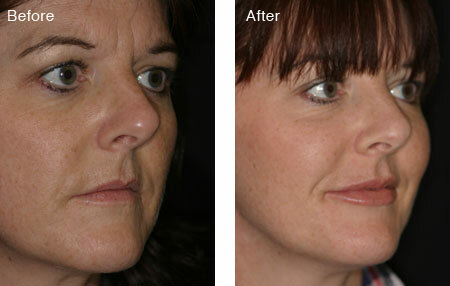 We used Botulinum Toxin on her frown lines and dermal fillers on the folds to achieve an excellent result. At a later date the patient returned because she was suffering from headaches. This was diagnosed as being related to tooth grinding. 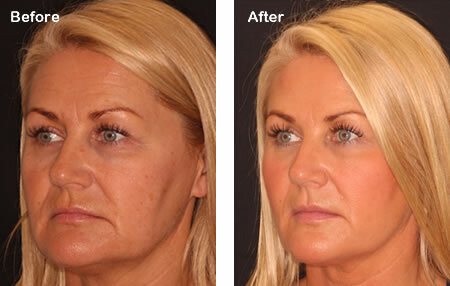 We gave Botox injections to the muscles responsible for chewing and her headaches disappeared. 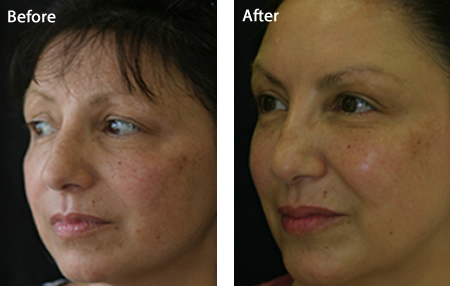 She then returned and requested further treatment to give her face a fresher look. We carried out a cheek augmentation to give a mid-face lift and a lip enhancement to give her rather thin lips a more beautiful shape. She commented afterwards that she felt better about her looks than she had since before her daughter was born. Her daughter is now 13 years old!! This gentleman wanted to reduce the appearance of his forehead lines. 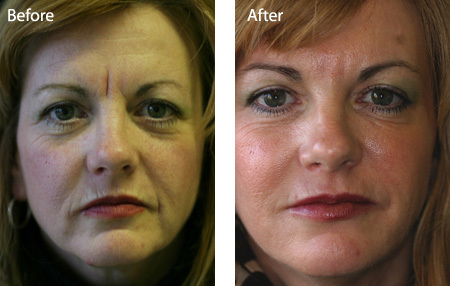 We used Botulinum Toxin to do this and you can see the dramatic difference. 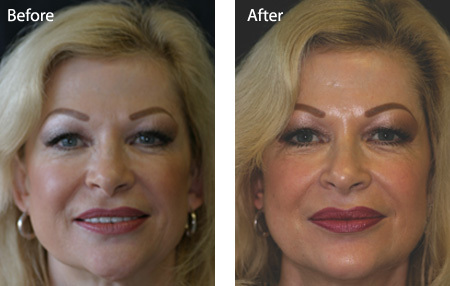 This is a lady who wished to have her lower face rejuvenated. We recontoured her jawline using dermal fillers, softened the muscles of her chin using Botulinum toxin and revitalised the skin of her chin, jaw and around her mouth using flowable dermal fillers. This lady came to see me because she thought that her face was showing her age and wanted to look fresher and younger. 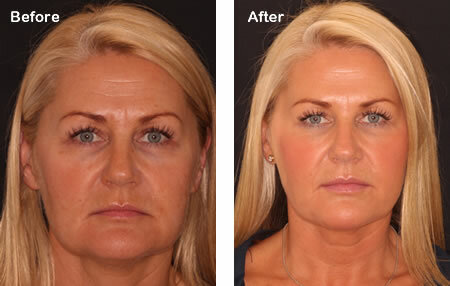 Her treatment involved dermal fillers and skin revitalisation to her lower face, botulinum toxin treatment to her forehead and crows feet, and, after a regime of skin care products, a chemical peel. 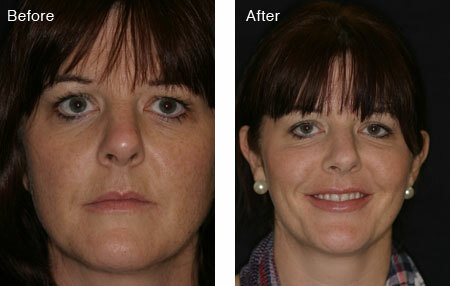 After treatment she certainly felt and looked 10 years younger! This patient had a combination of Botox and dermal fillers to smooth wrinkles and lift the face and create a brighter, fresher look. 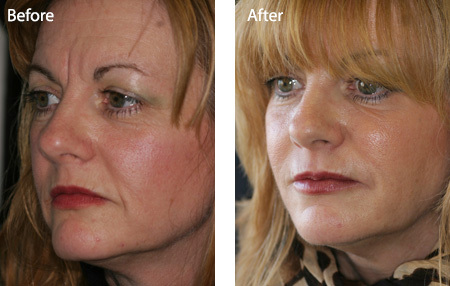 This included treatment to her forehead, cheek augmentation, lip enhancement, treatment to reduce jowls and skin revitalisation.